This weekend, we will play a special gig that we haven’t done before: We will play three Go By Brooks songs at “Aalt Stadhaus” in Differdange. What’s so special about it? 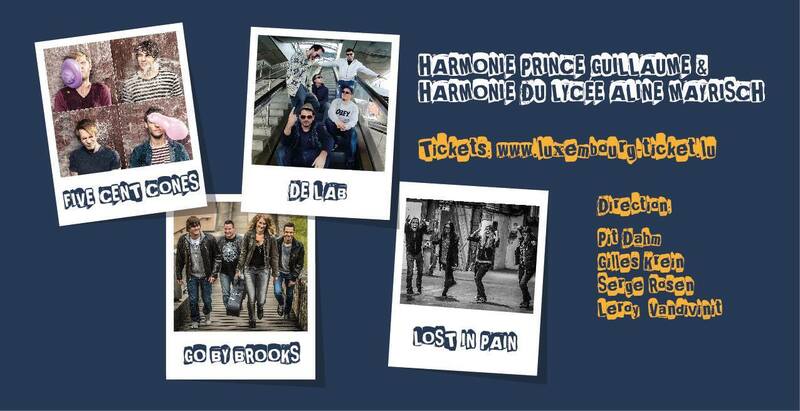 Well, first, two songs will be performed together with two orchestras, the “Harmonie Prince Guillaume” (HPG) from Differdange and the “Harmonie Lycée Aline Mayrisch“. There will be more than 60 musicians on stage. Our drummer Gilles has made some fine arrangements. It’s for the 3rd time that this collaboration between the 2 orchestras will take place. It will be the highlight of the anniversary celebrations of HPG. More infos and tickets here.